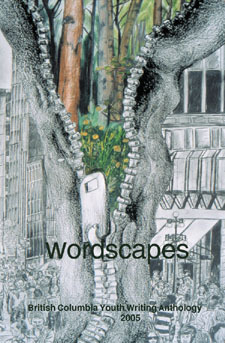 From 2002-2008, Wordscapes featured creative writing, environmental essays and visual art by over 40 youth writers and artists from British Columbia. 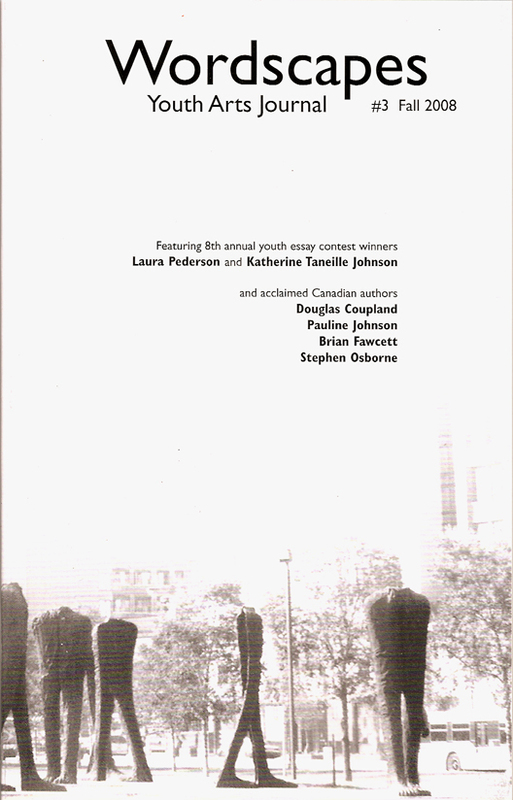 In the nine editions published by Ripple Effect over seven years, more than 320 youth artists were featured in Wordscapes, receiving over $50,000 in scholarships and royalties.The later editions include a Contemporary Writing section showcasing work by many award-winning Canadian authors, including Douglas Coupland, Christian Bök, Rachel Zolf, Brian Fawcett, M.A.C. Farrant, Billeh Nickerson, Wade Compton, Michael Hetherington, David Watmough, Stephen Osborne, Ryan Knighton, Carolye Kuchta and Janina Hornosty. To order backlist copies of any edition of Wordscapes, or for more information, please contact info [at] rippleeffect.ca. Individual copies are $4 each plus S/H. Complete libraries of all 9 editions are $30 plus S/H. Discounts are available for larger orders. 8.25 in x 5.25 in, 112 pages. Printed in Canada on 100% post-consumer waste paper. Featuring environmental essays by youth authors Laura Pederson and Katherine Taneille Johnson, front cover photo by Elisabeth Hill, and honourable mentions from the 8th annual Writing and Design Contest. Contemporary Writing section features acclaimed authors Douglas Coupland, Pauline Johnson, Brian Fawcett and Stephen Osborne. 8.25 in x 5.25 in, 96 pages. Featuring youth poetry by Annelies Bekes and Daniela Loggia, essay winners Andrew Johnson and Lisa Liu, front cover art by Ji Yeon Lee, and honourable mentions from the 7th annual Youth Writing and Design Contest. 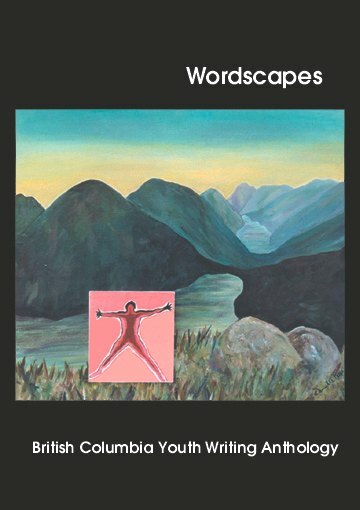 Contemporary Writing section features poetry by Christian Bök, Rachel Zolf, Billeh Nickerson, Wade Compton, Judy MacInnes Jr., Ryan Knighton, Barbara Adler, and more. 8.25 in x 5.25 in, 128 pages. Featuring youth fiction by Diandra Barsalou and Lowell Fleming, front cover art by Brianne Tweddle, and honourable mentions from the 7th annual Youth Writing and Design Contest. Contemporary Writing section includes fiction by Michael Hetherington, David Watmough, Janina Hornosty, Judy MacInnes Jr., Hilary Smith, Graeme Kelly and more. See also the Wordscapes launch parties on our events page. 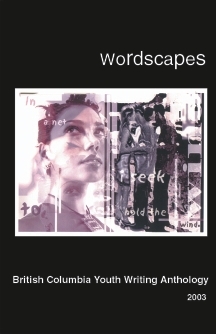 From 2002-2007, Wordscapes was published annually as the British Columbia Youth Writing Anthology. Published in the Wordscapes Youth Arts Journal (#1 Winter 2008). Past director of BCTELA’s youth writing program. “The book launch was great—listening and talking to the other young authors really gave me a sense of community with writers, whereas before this whole experience I felt like a lone pen in a sea of words.